What you should bring to all practices: Water bottle, running shoes, weather appropriate clothing. All runners should hydrate properly with water prior to arriving at practice, and should have their own water bottle at practice. Normal Practice Schedule on school days: Practice is every day, rain or shine, from 2:45pm to 5:15pm. Labor Day Practice: Monday Sep 3rd is Labor Day. There will be practice. If you are on family vacation, you are excused from practice. All other runners are expected to be at practice. Jewish Holiday Schedule: Sep 10th & 19th are school holidays. We will have practice: If you are on family vacation, or observing the Jewish holiday, you are excused from practice. All other runners are expected to be at practice. Columbus Day: There will be varsity practice on Columbus Day. Early Release Days: Practice or meets will go as regularly scheduled on Wednesdays. Athletes will be responsible for getting back to the high school for practice or the meet bus. Practice Policy for all runners: All runners are expected to be at every practice. Excused absences include sickness, doctor appointments, and family commitments. Coach Miller or Coach Voldman need to be sent an email as soon as possible notifying us of an upcoming absence. Being absent from practice without communicating with the coach is an unexcused absence. Please be aware that one unexcused absence will result in a one-week suspension from competition. More than one unexcused absence may result in removal from the team. Bay State Conference meets: Boys varsity race starts at approx 4:30. Girls start at approx 5:00. There is a JV race that starts at 4:00. There may be one JV race combining boys and girls, or if larger numbers, a boys jv race first followed by girls JV. Bus for all meets leaves from the back of the school at 2:40. It is strongly encouraged for the purpose of team-building and supporting other athletes, that runners stay at the entire meet and ride the bus back to the high school. However, athletes may ride home with a parent/guardian – please tell coach when leaving. To ride home with another athlete’s parent, an email must be sent to the athletic director (tcollins@natickps.org) giving permission. HOW IS A CROSS COUNTRY MEET SCORED? The last competition for everyone will be on Sat, October 28th; the Bay State Conference Meet. After that, some of the kids will be done for the season. 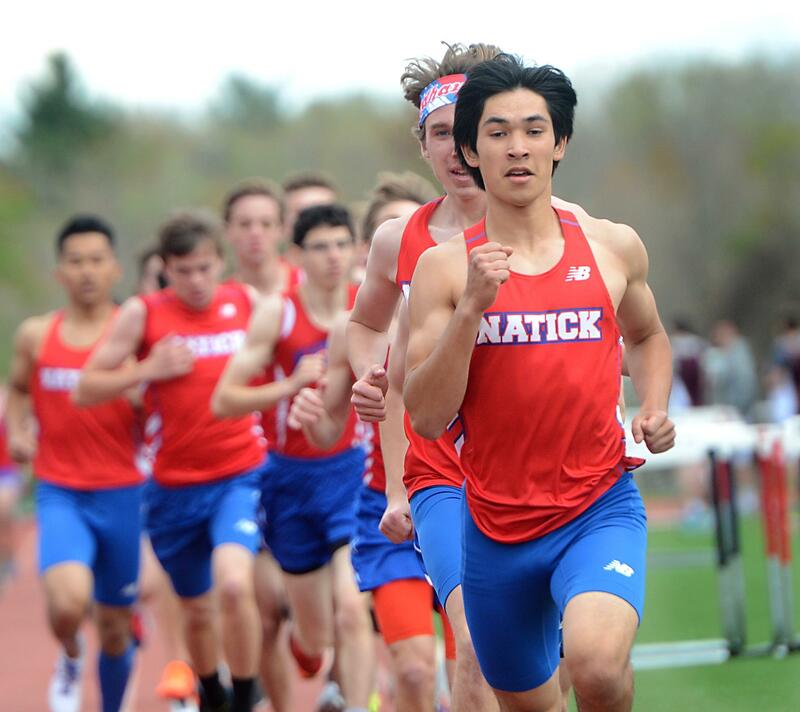 Runners participating in meets after the conference meet, based on performance and season-long effort, will continue to practice until their last competition.